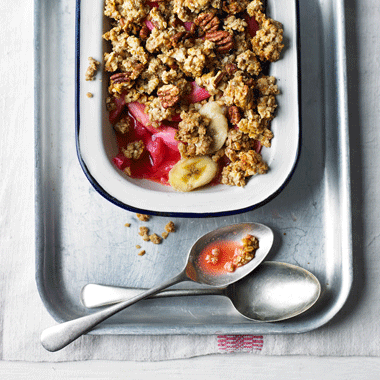 I love the texture that the banana brings to this crumble, but plums, peaches, apples and blackberries will all work brilliantly as a crumble fillings too. Place the rhubarb, orange juice and honey in a non-stick saucepan with a lid, and slowly bring to the boil, stirring occasionally. Reduce the heat, cover and leave to simmer for 5 minutes, until the rhubarb is soft. In a mixing bowl combine the oil and honey. Then mix in the ground almonds, oats, orange zest, cinnamon and pecans (if using). Stir well, ensuring all of the ingredients have combined with the oil and honey. Place the cooked rhubarb in a small oven-proof dish, and top with the banana slices. Drizzle over the cooking syrup from the rhubarb. Scatter the crumble mix evenly over the dish, so that it forms a thick layer but is not tightly packed. Place in the oven for 15-20 minutes, until the top is browned and the fruit underneath is bubbling slightly. Divide the crumble between 2 serving bowls and dollop crème fraiche onto each one. Eat while still warm.